Human beings have a different sense of existence from that of animals. The manner in which we conduct our business is largely different from our usage of tools. Much more difference has been noted in the way we present ourselves. Even from prehistoric times, the oldest artifact can attest to these facts. Such artifacts represent a civilized world in the human race. Archaeological works have revealed ancient artifacts that have been in existence for many years. They carry with them important dates of the existence of our ancestors in a way that we can relate with the changes happening in today’s world. Believed to be more than 77, 000 years old and maybe the oldest artifacts ever, these artifacts were first found in 1983, although documented records state that much more discoveries were made in 1998. South Africa is the home to the Sibudu Cave where these artifacts were found. The main items at display include needles, arrowheads and bedding made of bones. They depict technology at its best in a time that is unbelievably too primeval to have such objects. Life before the time of these artifacts was lived simply. However, the artifacts speak of a time when immense development into complex works started. In what seemed like an unusual occurrence, a map artifact aged more than 14,000 years was found in 1993. The discovery was made in Spain by scientists. The map is embedded on a stone tablet. The artifact reveals a time when maps were not common and neither did they seem to have any use. Primarily, people could just walk around as it is the main highlight in this artifact. Measuring about 13 cm by 18 cm, the stone artifact highlights things about its surrounding including animals and human beings. It signifies a time for hunters and gatherers. These artifacts of the Ubaid Lizard were discovered when they were about 7, 000 years old. They were discovered during the start of the 20th century in 1922, in Iraq. They primarily appeared like human beings though seemed like lizards especially looking at their heads. These amazing artifacts have unknown descriptions. However, some wore helmets and others held scepters, which could be easily interpreted as a sign of power and authority. Others showed female human creatures with suckling babies. Generally, they represented Ubaidian people who lived in that Mesopotamian age (5,500 -4,000 BC). This artifact of what is believed to be the oldest shoe was found when it was about 5,500 years old. The discovery was made in 2008 in Armenia. It is made of leather particularly for the right foot. It shows an innovation of its kind, being able to last for all these years before it was discovered. Its wrecked appearance explains a lot about a long distance walker. This artifact tells us of a time when human beings would just walk as the only option of moving from one place to another. Apparently, the shoe could facilitate this long distance walking without getting worn-out too easily. This wheel, believed to be 5,200 years old when it was found, is one of the oldest artifacts. It was discovered in 2002 at Ljubljana, Slovenia. The wheel measuring 55 inches in diameter is fitted with its axle, 47 inches in length, which supposedly would be just an assembled half of what looked like a wooden cart. The artifact is made from wood. The wheel has formed an important part of history and this artifact is a highlight of what it was all about. It signifies a major step towards technology and civilization by the ancient man. By the time “The Trundholm Sun Chariot” was discovered, it is believed to have been about at most 3600 years old. It was found in 1902 in Sjælland Island in Denmark. The artifact is made from gold used for a thin sheet to one side of the disc and bronze particularly for the horse, disc and the six wheels of the chariot. The significance of the chariot is connected to rituals of those ages although it is also felt that it was an important object used as a calendar of telling times and periods of the year. The stone head at Guatemala was an artifact which was about 3,300 years old when it was discovered in an area that was known for stone heads. The artifact was found in the 1930s at the Guatemala jungle. It is made of sandstone. The artifact cannot be linked to any of the inhabitants with the region, even the Mayans. As a result, people have tried to identify it as a primeval alien civilization believed to be more sophisticated than any of other known American race. Some people had speculations of the artifact being just a part of an underground object. These Mexican government Maya artifacts were discovered when they were about 1300 years. This was back in 1932 at Calakmul, Campeche- Mexico in one of the sites of a primeval Maya city. The artifacts were made from clay and stones. Since then, the Mexican government held them as a state secret. Believed to have been released in 2012, the Mayan artifacts shows livelihood in mankind with traces of highly innovative technology characteristic of space travel which can be said to have existed during that time. Generally, they show origins of mankind in research and development of unidentified flying objects and aliens. 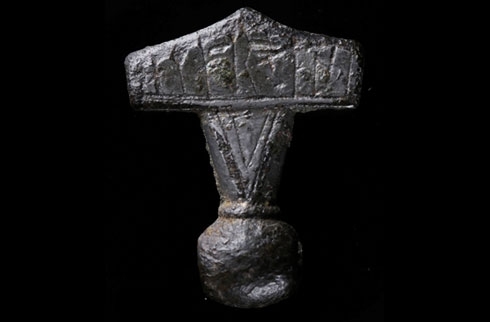 The Thor’s Hammer artifact was found when it was 1,100 years old. Discovered in Denmark, it dates back to 900 AD. It is made from bronze with some gold, tin and silver linings. Based on the mythology of Norse, Thor is a god that used a hammer. The god signified strong qualities and natural causes like storms, lightning and thunder as well as the preservation of mankind by ensuring fertility and healing. The hammer was used for tough operations including dealing with various kinds of evils like natural calamities. It is associated with the introduction of Christianity in the Scandinavian world. This artifact was formed in 1538AD in Bruges city, Belgium. It is a textile art that has been woven into various images hanging in the sky and people on the ground. On first sight, there is nothing seemingly visible. However, a careful look into it shows conventional UFO images in the sky. It shows the rise of a ruler to leadership. There are speculations that the artifacts may have been added in the embroidery with an intention of depicting divine control with UFOs. The Belgians of this time apparently valued flying saucers and linked them to spirituality.